In these modern days of motoring marvels there seems to be little connection between AWD, size and capability. With so many beefed up wagons with AWD, how do you know which one to buy? There is so much choice in the medium-size wagon/small SUV,AWD market. Volkswagen thinks they have the best answer in the new Volkswagen Golf Alltrack. After reviewing the Alltrack, I was left impressed with the quality and practicality of the new VW model. Priced around the $40,000 mark, the AWD Golf Alltrack Wagon is a particularly well made machine that has plenty of light-roading ability and superb comfort and refinement. There are other alternatives like a new Subaru Outback (hard to beat) or even the snazzy new Skoda Octavia, so what appeals when it comes to a new Golf Alltrack? 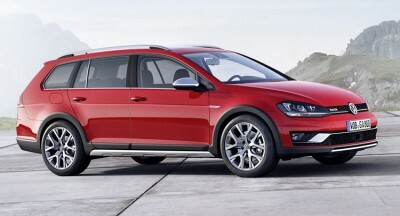 I think it is the excellent ride comfort, engine performance and build quality of the new Alltrack that grabs me most. Exterior design is on a par with other wagons in its class. It will be tough to beat the great Scandinavian CrossCountry models from Volvo, though. Yes, it’s pricey, but with the new VW Golf Alltrack you do get a lot of kit, practicality and light-off-roading capability for your money. I guess you could say it is one of the best small SUV wagons on the market, and it is very pleasant to drive. One of the standout features of the vehicle is the powerful 132 kW, 1.8-litre, turbocharged TSI engine with fuel-efficient BlueMotion Technology, a six-speed DSG transmission and 4MOTION all-wheel drive – including driving profile selection with Off-road mode. This little gem works remarkably well in all road situations, not least light off-roading. The sparkling little engine has such brilliant flexibility to match the demands of light off-roading duties. Performance from the TSI engine is sparkling, and you can see the 0-100 km/h sprint finished in around eight seconds. Expect around 7.5 litres/100 km fuel usage – certainly a figure that should not break the bank balance. The ride is comfortable and assured, so when the roads go third-world on you, the Alltrack is the perfect car for the job. Boasting an on-demand four-wheel-drive system, the Golf Alltrack Wagon runs on FWD most of the time, flicking into AWD when the conditions become slippery. The all-wheel-drive system is, actually, the same system used in the performance Golf R model. However, The new Volkswagen Golf Alltrack gets an off-road mode that enables hill-descent control and changes ABS modulation. The firm suspension provides handling that is superior to any medium SUV competitor, bar perhaps the Volvo equivalents. This would make a perfect ski wagon. Chunky bumpers give it greater protection in the rough, while the extra 27 mm ride height and 4WD system will get you further when the going gets tougher. Having a higher ride height and stronger underpinnings gives the car a very solid feel to all on-road conditions, as well. Other features unique to the Golf Alltrack are the classy looking 17-inch alloy wheels, Bi-Xenon headlights, chrome roof rails, silver trim strips and side mirrors and exposed chrome exhaust tail pipes, black bumper and wheel arch extensions, and Alltrack badging. When it comes to taking luggage with you on the journey, the Golf Alltrack is able to swallow 605 litres of cargo with the seats up. Not as large as a Subaru Outback or Volvo XC70, the Golf seating could be a little cramped in the rear if your family is taller than average. The seats are comfortable though. The Alltrack would make an ideal car for four tall adults rather than five. The new Volkswagen Golf Alltrack is a nice complete package, so ensure you check one of these out before buying. For any more information on the Volkswagen Golf Alltrack models or, for that matter, any other new car, contact one of our friendly consultants on 1300 303 181. If you’d like some fleet discount pricing (yes even for private buyers! ), we can submit vehicle quote requests out to our national network of Volkswagen dealers and come back with pricing within 24 hours. Private Fleet – car buying made easy!